Vollständige Bewerbungsunterlagen müssen spätestens bis zum 16.01.2019 elektronisch (als PDF) an akr@projektraeume-berlin.net eingereicht werden. Eine weitere Besichtigung des Objektes ist geplant für Mittwoch, den 09.01.2019 um 11.00 Uhr. Bitte melden Sie Ihre Teilnahme an. As part of the „Workspace Program/Arbeitsraumprogramm (ARP)“ of the Senate Department for Culture and Europe, we are pleased to have a space in Lynarstr. 39 in Wedding for use as a project space. The rent for the project space is subsidized proportionately via the workspace program. The store room is located on the ground floor of the new building complex, a construction project of the housing cooperative „Am Ostseeplatz“ eG, with intergenerational living and social institutions like the Berlin homeless help (Berliner Obdachlosenhilfe e.V.). The carrier and rental contractor is the GSE Gesellschaft für Stadtententwicklung gGmbH (http://www.gseggmbh.de). The lease is limited to 3 years with a 2-year extension option. The selection takes place on the basis of the submitted application documents by an advisory board. 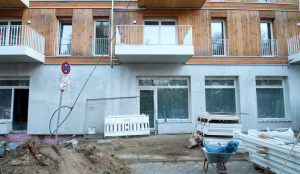 The process is coordinated by the network of Berlin Project Spaces and Initiatives e.V. A viewing of the space is planned for Wednesday, 09.01.2019 at 11 a.m.. Please register in advance.